HMMH was retained by Baltimore Racing Development to conduct a noise analysis study of the proposed Baltimore Grand Prix Race Weekend. The objective of the study was to evaluate the expected noise levels associated with the race vehicles during the Race Weekend and the potential effects on the surrounding land uses adjacent to the race route. HMMH conducted measurements of existing background sound levels in residential areas adjacent to the proposed road course. To determine expected sound levels during racing, HMMH conducted measurements of the Long Beach, CA Grand Prix race weekend. 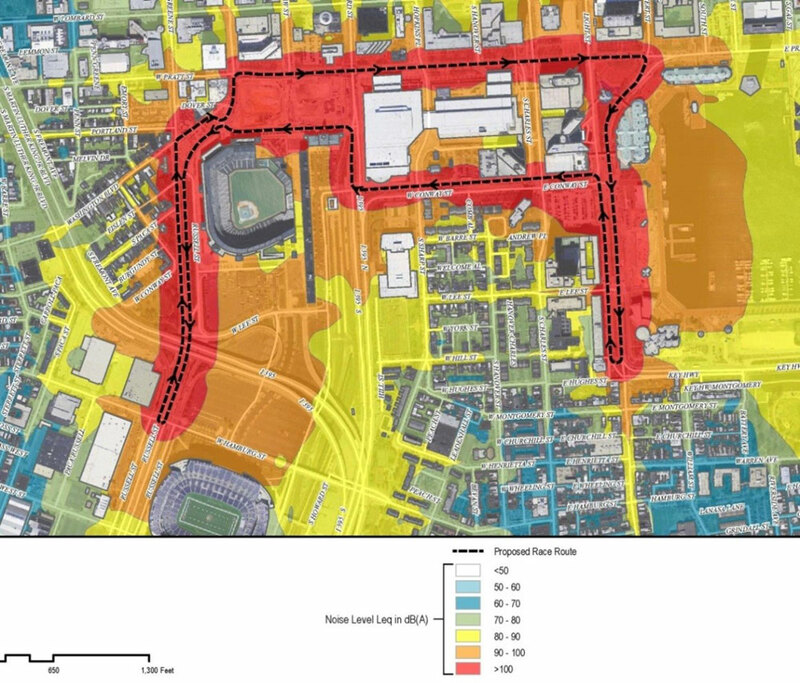 HMMH then modeled the race course in Baltimore and projected sound levels from racing in the adjacent neighborhoods. HMMH compared projected sound levels to existing levels and to criteria for interference with speech both outdoors and indoors, and also evaluated the effectiveness of noise abatement measures. The study addressed the potential for racing noise to interfere with communication in nearby residential buildings and the potential for effects from noise-induced vibration.